Do Victims of Bullying Have a Role to play? What do you have to say on the idea that bullying victims have a role to play? What are examples? The behavioral dynamic playing out is between bully and “victim” though it’s probably better to think of “victims” as “targets” of aggression. From a behavioral standpoint, the only people who really have the power to train a bully to stop are the targets. Bystanders and administrators also have a role to play, but they cannot play that role until or unless the target does certain things to trigger bystander and administrator responses. I realize a lot of people will react to this statement of fact negatively and claim it is victim blaming. It isn’t. , While targets don’t do anything in particular to attract bullies to them, how they respond determines whether they will come down with a chronic case of bullying or whether the bully moves on to other victims. It doesn’t help people who are being targeted by bullies to tell them there is nothing they can do to make it stop. There is something they can do and they should be taught the life skills necessary to make it stop! Telling people they have no power to stop what is happening to them is victimizing. Telling them how to claim their power to make it stop is empowering. 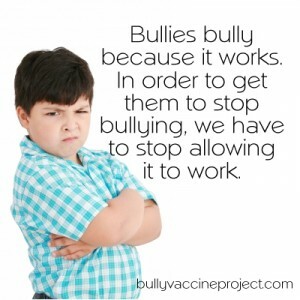 To recap – a target doesn’t cause bullying, but they can behave in such a way that will make it stop. The reward for the bullying behavior is almost always coming from the bystanders for whom the aggressive behavioral display is being performed. Think of this as a display to say “see how powerful I am – I can control this other person. Fear me!! !” If the target of this display submits to it or shows fear or cowers or whatever, the performance is complete and the bystanders respond to the display as predicted by our instinctual programming. If, however, the target does not cower or submit, the bystanders see that as well and instead of seeing a display that shows the bully being powerful. They see the bully being rude and incompetent, not powerful. So – what does a target need to do. They need to strategically non-reinforce the bully. What this means is that they need to respond to the bullying in a calm manner in a way that tells the bully to stop. A calm – statement – stop is sufficient to do this. Because this is a behavior being performed, making eye contact is also helpful. But mostly it’s about tone of voice. This part is very easy to learn and do and even kids with developmental problems can do this. If the bully doesn’t stop on the command – stop. The target should then report them. No arguing, 2nd chance or letting it go this time. It is important to report every instance. Tell them to stop. If they stop, great. If they don’t, report them. This should not be emotional, it’s a matter of fact transaction. You aren’t asking them to stop you are telling them to stop in a neutral calm tone of voice. They either do or they don’t and what happens next is up to them. If they don’t stop, they get in trouble. Period. Every time. What the target is doing is removing the reward and raising the cost of the behavior. The 2 things together is what will make the behavior stop. It will take time though as bullies respond to losing their reward by getting more aggressive. They are doing this to get their target to back down. If they can get the target to stop, they win and their display of dominance is re-established. This is why it is critical to keep reporting this until they stop. What you want them to learn is that it doesn’t matter how aggressive they get, you don’t accept their dominance display as valid. After a couple of weeks – they should stop if this is done consistently. People who learn this skill and practice it find that it is very empowering. They go from considering themselves victims of bullying, to understanding that they were targeted and dealing with it effectively. They also lose their fear of bullies and that makes them really powerful. To learn more – read the book, join the website to access all the free material and be sure to share this information with others.